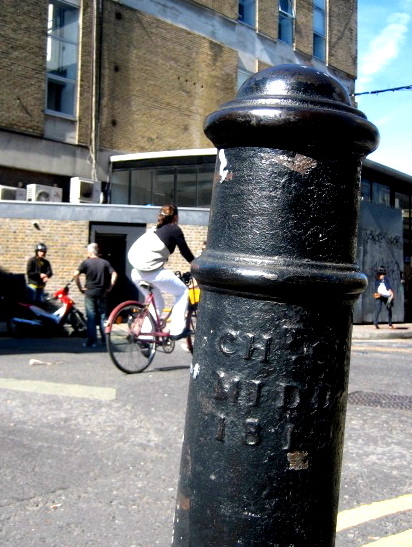 Down Hanbury Street, on the corner of Brick Lane and also on the corner of Wilkes Street, stand hefty cast iron bollards that you have walked past a thousand times. Put up in 1819 to mark the boundary of Christ Church Parish in Middlesex, they have been sturdy silent witnesses of life here over two centuries. 1819 was the year of the first financial crisis in America, the Peterloo Massacre and the opening of the Burlington Arcade. Children run round them in play, young couples part momentarily to pass on either side and old people steady themselves by placing a hand upon them. Thus, years have passed and the marks of the iron casting have become smoothed by human touch. No longer is the parish of Christ Church in Middlesex, because as London has spread to become Greater London, Middlesex has shrunk. While the notion of a parish itself might be redundant, these cast iron posts now serve to protect us from cars that could drive up onto the pavement. There is another I have noticed, over in Durward Street, recently spruced up with fresh gloss paint by the council – crudely highlighting the lettering. At the back of Whitechapel Tube where it stands, there is nothing else surviving from then. It alone evidences an earlier world. I enjoy this contradiction, that what is most mundane, functional and disregarded might be the oldest thing. If you share my interest in such minutiae, there is now a website documenting overlooked Design Details in our neighbourhood. Click on the link to learn more. 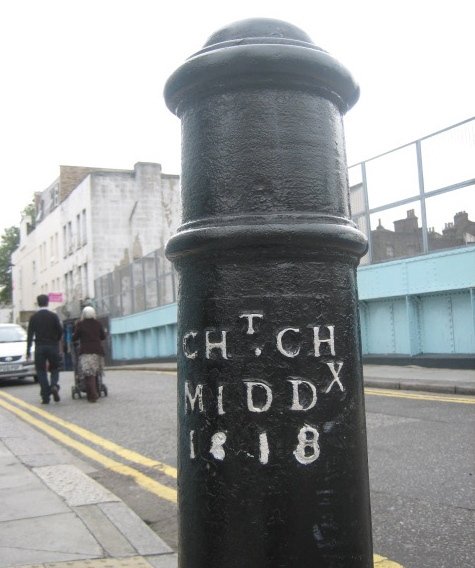 interesting fact, if you like that sort of thing – bollards were originally made from decommissioned ships guns, there are still quite a few original ones around ‘nautical london’, and the shape has remained pretty much unchanged to this day. Now you mention it Dermot, it reminds me that in my childhood there used to be a very fine one at the quayside in Exeter made from a cannon captured in the Napoleonic wars. This Sunday I’ll be at the Quay in Exeter, I’m going to look for it. There’s something very poignant about them and their stories.